February half term breaks can be the stuff of nightmares. Or is that October half term and all the dressing up and knocking on strangers’ doors? Halloween aside, half term breaks should be fun. And what can be more fun than packing the kids into the car and joining a stationary queue of other cars all heading to the tired old holiday destination that you queued up to visit when you were a kid? At least the leftover trick or treat sweets can soften the blow and keep them quiet. Or, could doing something completely different be the answer (and you can save the sweets for October)? So for February half term breaks this year why not escape the old routine and do something new? Stay on a boat with Beds on Board and enjoy another way to stay. Beds on Board lets you rent boats directly from the owner for overnight stays. You don’t need any experience as the boats don’t move. Common sense is required so think about the age of your kids but these and any other questions can be answered by the owner before you book. The first thing that kids love about staying on boats is the excitement of something new. Exploring below deck and finding their cabin or bunk is a lot more fun than walking into a hotel room. They’ll also love that feeling of independence and can start thinking of how cool it’s going to be telling their friends what they did this half term. Getting the kids their own space is a lot more affordable than in a hotel. Family rooms or a second room can be expensive but the prices you see on bedsonboard.com are usually for the entire boat – so kids can get their own space! So you can get some downtime, either in your own master cabin or on deck with you favourite drop. Staying on a boat is also a great time to reconnect with your family and with the great outdoors. Swap the screens for the skies as you spend time as a family, watching the sun set and the stars come out. Most boats are in amazing locations. Whether it’s in the heart of the city or on a beautiful coast. The choice is yours. Restaurants and shops are within easy walks so sampling local food and drink is easy as stepping of your deck and into the marina or the local town. There’s a lot of wow factor in staying on a boat. Some great dinner party stories to get you through the next term and some playground kudos for them. So don’t let this February half term be a nightmare, make it a dream with a break on a boat with Beds on Board. 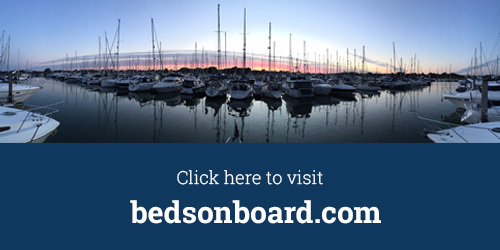 Learn more at bedsonboard.com now.